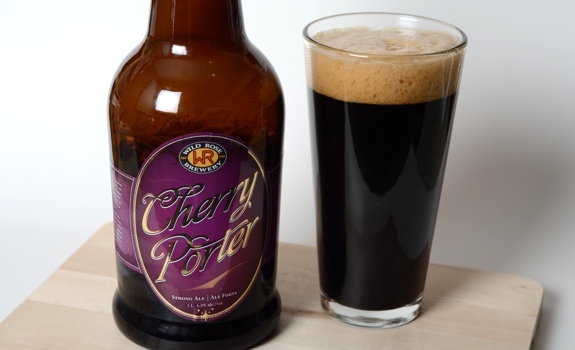 Wildrose Brewing's special seasonal Cherry Porter is a big, flavourful beer. Perfect for sharing, if you're feeling the generous type. When toasting the new year, the easy choice is a sparkling wine. It’s traditional, it’s a zazzy crowd-pleaser and it’s the simple thing to pick. But maybe others don’t like the whole champagne at midnight thing? Maybe they’d like another form of bubbly goodness? If you’re going to toast with beer, you’d might as well toast with something interesting. No, raising a can of Lucky Lager to usher in 2012 is not going to keep your gathering classy. 1. Some people don’t do booze for religious reasons, but that doesn’t mean they don’t like to have fun at a party with friends. 2. Same thing goes for pregnant friends or relatives. 3. Designated drivers need love, too. NEAROF!’s home base, Calgary, is in a province that recently passed some tough new drunk driving legislation. If you were careful about drinking and driving before, you’re going to want to be extra careful about it now. Your best bet? A designated driver. And guess what – they get thirsty, too. 4. Just because you don’t think you know any reformed alcoholics doesn’t mean there aren’t any reformed alcoholics in your life. Wild Rose Brewing’s Cherry Porter: This behemoth of a 1 litre bottle ain’t cheap at $12.99, but it’s perfect for sharing with the special person in your life who appreciates curious brews as much as you do. And this, let me tell you, is a curious brew. A yearly tradition, the limited-edition Cherry Porter from Calgary’s Wild Rose Brewing is thick, smooth and brimming with roasted malts and dark cherry notes. The label talks of Black Forest cake, but the beer is more tart than sweet. At 6.5 % a.b.v., it’s deceptively strong. With so many other flavours at work, you hardly notice the alcohol. Crazy stuff. Alley Kat’s Cringer Cranberry Ginger Ale: A very understated ginger beer, there’s only a bit of fruit and a bit of ginger zing to this limited edition brew from Edmonton’s Alley Kat. I think I paid about $5 for a 650 mL bottle of the stuff at a liquor store in Kensington, a price that included a free Alley Kat bottle opener. Nice. Some kind of yummy IPA: I know that both of the above options won’t be available far and wide, so let’s go a bit more generic with the third pick. Nothing specific – just look for a genuine (ie. not Keith’s) India pale ale (or double IPA) that’s going to be packed full of sippable flavour. If you can find a bottle of Amnesic Double IPA from Victoria’s Phillips Brewing, you won’t be disappointed – it’s super hoppy without being overly bitter. There’s some sweetness, and the alcohol adds warmth. At 8.5% a.b.v., each 650 mL bottle should be approached with caution, not guzzled. The Lime Jody: Simple but filled with citrus goodness, the Lime Jody – named after my cousin’s husband, who first introduced me to this drink – is an easy choice that requires few ingredients and little time to prepare. It’s as simple as combining Lime Cordial (I use the Rose’s brand, available at your local Safeway) with some soda water, adjusting the syrup/soda ratio to taste. You can also use some lime juice, or sub out the soda water for Sprite or 7-Up. Garnish with a slice of lime, and you’re good to go. The Cranberry Ray: Back in my university newspapering days, one of my friends ordered a simple mix cranberry juice with 7-Up at one of the university bars between editing sessions. The cranberry makes it a good fit for the holiday season, so it’s got that going for it, too. Ikea Sparkling Juices (Dryck Bubbel): The turn-key solution to your non-alcoholic bubbly problem. There are several flavours available, but I’m a fan of the pear. I think I paid something like $2.50 for a bottle on sale a month ago. At that price, why not pick up half a dozen, just in case other guests decide they’d like something fruity and sweet, minus the alcohol. I’ll be goin’ the import route later, bringing in 2012 with a Roch(e)fort 10. But I had And really enjoyed a Yukon beer last night, the Yukon Red(an amber ale, 6%). Very subtle malt åroma, but rich malty flavour-bit toffee-lsh. Then a red fruit note(red grape & believe it or not, I picked up a bit of strawberry). Nice & biscuity before a clean, drying ‘more-ish’ finish. *big thumbs up*…I’m considering a six-pack in the new year.